So, you've washed your hair and it looks fabulous and the next day you wake up and it's lost its bounce and it just hangs lifeless with a bit of a greasy tinge. Well, the answer is dry shampoo but not just any dry shampoo. It has to be Batiste. 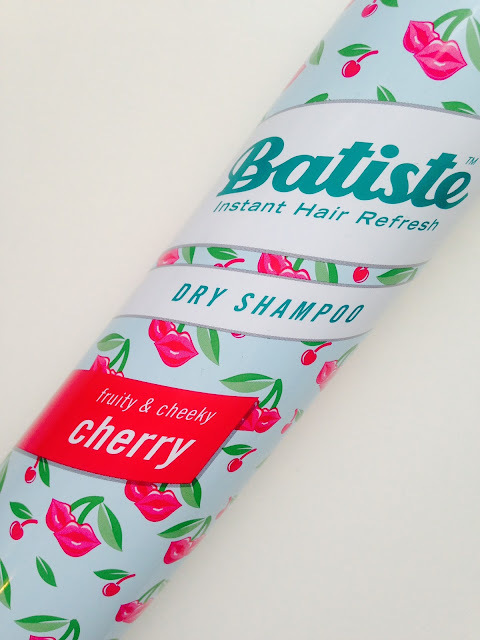 I've tried several other dry shampoo's in my time and none of them quite match up to the quality of batiste. I've always found other dry shampoo's to be too chalky and leaving too much residue and making my hair feel gritty and too flat. Other's smell nice and make my hair feel okay but halfway through the day, the greasiness starts to come back through. Batiste has never let me down. I know if i'm having a day where my hair feels like it needs a pick me up or i don't have time to wash it, i can spritz a little on my roots, rub in and be ready to go. It blends into my hair well and even on those days where i've used the original white dry shampoo on my darker hair, you still cannot tell. Which i think is brilliant. I mean, who wants white patches on their hair when they're trying to look fabulous? Batiste comes in all sorts of colours, whether you're blonde or brunette - there's something for you. There's also an assortment of amazing smelling dry shampoo's. I'm currently using the cherry one and every time i swish my hair, i get a whiff of the cherry smell and oh god it makes me happy. You really cannot go wrong with Batiste. Perfect for festivals or just those days when you C B A. If you've never tried a dry shampoo, it could well be the saviour you are looking for. Gone are the bad greasy hair days and here are the great hair days we've all been waiting for! You can pick this up for around £3/£4 from supermarkets but i always buy it from Boots as i can collect the points to spend on myself at a later date too! Try it for yourself and be converted to the world of dry shampoo!